The Chinese government acknowledges that serious inequalities exist in the country's healthcare provision - rural areas are seriously under-serviced compared to the cities. More than a decade ago the government announced a grand plan to try address some of these inequalities - by sharing the expertise of big city hospitals with rural areas. The plan was for medical personnel from tertiary hospitals in prosperous eastern China to spend time in placements and long-term exchanges in disadvantaged rural hospitals and clinics in poorer parts of western China. However, the so-called "Myriad Doctors Supporting Rural Health Care Project" has not been a complete success (to put it mildly), according to a letter in the Lancet this month from Dr Wang Tao of the Shanghai Jiaotong University Sixth Affiliated Hospital. After touring western districts to see the progress of the project in its 10th year, Dr Wang found that it had helped bring medical personnel and technology to some poorer areas. However, the project was also under-resourced for such a major undertaking. Lack of funding meant that hospitals struggled to pay their seconded medical workers an adequate wage. The transfer of five senior doctors from each supporting [eastern China] hospital to a disadvantaged hospital on six-month shifts also proved impractical. "These long-term arrangements create a huge burden for hospitals in eastern provinces and can cause personal difficulties for medical staff," he writes. Another problem was that medical resources were allocated by government bureaucrats rather than determined by need. "Coordinating this huge project that involves thousands of hospitals and medical workers according to strict policy guidelines is extremely tough, and inefficiencies and repetitive allocation of resources inevitably arise," says Dr Wang. The project has not done much to address inequalities in healthcare, he reports. Latest figures show that eastern China areas have average annual healthcare funding levels of 1067 yuan per person, whereas in western China hospitals have only half that level of resources (about 500 yuan per person). 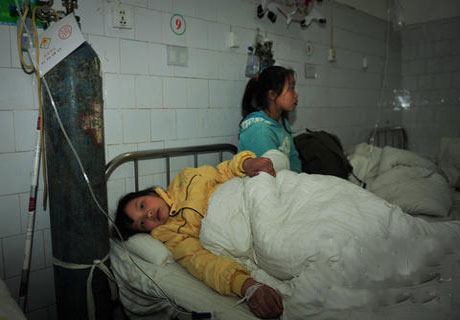 Inequalities also exist in the numbers of hospitals, doctors, nurses and beds between eastern and western China. "Healthcare inequalities remain a serious problem and necessitate support projects for the foreseeable future," Dr Wang suggests. He asks whether market forces could succeed by encouraging hospitals in eastern provinces to open public or private amenities in the western provinces. "New sources of income might provide sufficient motivation to create efficient, high-quality services. The fear is that new sources of income might cause new problems, counteracting the government's attempts to reduce inequality. Nevertheless, the consistent provision of an excellent level of health care in China, particularly in less developed areas, still has a long way to go."